Within Navajo Lake State Park in the scenic high desert of New Mexico, boaters have flocked to the Four Corners area at Navajo Lake Marina. A 15,000-acre body of water at full level, the dam-filled lake was completed in 1962. It was part of the Colorado River Storage Project and serves as the main storage reservoir for the Navajo Indian Irrigation Project, providing water for about 110,000 acres of land. It’s a hidden gem in New Mexico. Many don’t even know the lake is there. Owner Jarrett Johnson has worked hard to change that, making amazing strides. The marina’s exact location on the water varies with the water level. It sits approximately 10 miles from the small community of Navajo Dam and more than 25 miles from the nearest grocery store. But boaters have no trouble finding the remote, pristine location and they have kept returning to the lake paradise in the desert. Johnson is president of Navajo Dam Enterprises Inc., (NDE) the entity that operates the marina, and runs the day-to-day business. He grew up boating with his parents from the coast of Halifax, Canada, to Barbados in the Caribbean, and many places in between and inland. Johnson operates NDE with his partner and mother, Margaret Vandervalk. “She has a multitude of job titles,” Johnson said. Among them, she is an attorney, which became instrumental in securing the permits and approvals necessary for renovations and improvements at Navajo Lake Marina. Johnson grew up in the Dallas area and was in the real estate business before marinas. He began eyeing marinas as an business in 2005 and got serious about acquiring one in around 2008. It would still be another five years before he bought Navajo Lake Marina. During that time, Johnson made efforts to purchase other marinas, but deals fell through, and he spent extensive time visiting marinas. He had essentially been doing that all his life, but began going to look at the business, ask questions and take pictures. He has been to well more than 1,000 marinas and has more than 40,000 photos from his travels. Johnson has brought many of those ideas to his marina, where he turned a quiet desert marina into a bustling boater center. Not only a place for long-term slipholders, but also a gathering place at the waterfront, the marina caters to customers interested in fishing, boat rentals, birthday parties, or just a great day at the waterfront. Johnson has meticulously tailored his amenities to appeal to many different kinds of boaters, young and old, new and experienced. He’s helping to breed the next generation of boaters, in the middle of the New Mexico desert. For this and many reasons, Marina Dock Age magazine congratulates Navajo Dam Marina as the 2017 large Marina of the Year winner. The initial slips at the marina were built by New Mexico State Parks (NMSP) in 1964. The next year, a fishing barge was added, and by the mid 1980s, the barge included a ship’s store and restaurant. NMSP turned the operation over to a private concessionaire in 1986. Three private operators ran the marina through its initial 20-year lease, which was extended to 30 years. The next operation bid went out in late 2015, and in March 2016, NDE was awarded a 30-year concession through March 2036. More than $1.5 million was invested into the property, prior to the new concession agreement, and another $3 million has gone into the marina since then. The operation had been on cruise control for some time before Johnson began operations, and he had a much grander vision. There was a waiting list for slips at Navajo Lake Marina, when Johnson bought it, and he knew it had so much potential. Marina Dock Age previously wrote about much of the renovations done at Navajo Lake Marina, in the July/August 2017 issue on page 24. The charts on page 14 also list a number of the renovations and amenities at Navajo Lake Marina. Johnson saw potential everywhere, in the store and restaurant, which were adequate but not profit centers. He saw potential in boat rentals and at the 8-foot wide covered walkway out front, where visitors and kids fishing and boats coming to the store, all competed for limited space. The space and new slips relieved pent up demand and made better use of the space as a gathering area, including courtesy slips, and it greatly reduced congestion. At 6,100 feet elevation, winters are cold, but the marina operates year-round. Revenues at the marina have increased substantially from 2013 to 2017. The ownership put in a huge investment and has been paid back with more customers, full slips, and new visitors. Johnson said that although the winters are slow, he feels it’s important to support full-time positions for his employees. “We’re slow in the winter months, and I’m going to find a way to keep them busy and work on future projects,” Johnson said. The marina has a maintenance staff of six, which it keeps very busy. Aside from the dock construction, the staff does a lot of the building in-house for other projects. The marina has gone from 13 to 17 full-time employees. Johnson believes strongly in cross-training. “You’re not doing the same job two days in a row. You’re not just a dockhand or just a boat rental captain,” Johnson said. 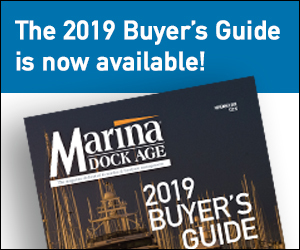 From May to September, the marina adds some seasonal staff at the ship’s store and the fuel dock, but works to keep as many full-time employees as possible. They may assist with rental boat operations in the summer and work more traditional maintenance roles in the winter. Some employees rotate more regularly throughout the week during the summer, as the operation’s needs dictate. Johnson has three long-term employees with 50 years combined experience who were at Navajo Marina before him. They are a great sounding board for his many ideas and help fix problems and find solutions quickly with their vast history at the facility. To further support his employees, a number of them keep boats at the marina slips free of charge and often sleep on their boats. With the marina’s remote location, the cost of gas and travel back and forth can be prohibitive for some workers. The marina also offers full-time employment with 10-hour work days, fours day a week. Boaters and visitors travel far and wide to get to Navajo Lake Marina. The two closest towns include Farmington, New Mexico, an industrial oil field town of about 45,000 people, about 45 miles northeast from the marina. Durango, Colorado, is about 50 miles southeast, with a population of about 18,000. The state only has two to three decent lakes, depending on boaters’ standards, Johnson said, so boaters travel far. The marina draws a huge crowd from Albuquerque, about 160 miles away. “We have a lot of customers that come on Friday and go back on Sunday night or Monday morning,” Johnson said. He said it’s very much a houseboat crowd, not a lot of cruisers. They come up to enjoy the time on the water, often staying overnight where they want the extra space on a vessel. The marina went from no marketing in the beginning to a diverse portfolio. Many people in the area didn’t even know the lake was there. Marketing efforts at the marina include TV and radio spots, printed brochures, local travel magazine ads, branded clothing and gear, and billboard advertising. One of the most successful marketing efforts for the marina comes from Facebook. “We just surpassed 10,000 followers on our page,” Johnson said. About 9,000 of those were purely organic, didn’t cost the business a dime. Only recently, Johnson has begun some Facebook advertising to further promote its content to new customers. The marina does all its own in-house videos. It owns four cameras, plus a drone. “It’s nothing really exorbitant,” Johnson said. “We got permission from the Bureau of Reclamation to fly the drone over the marina.” The videos are edited in simple, free software, like iMovie from Apple. He said it’s phenomenal the response the marina gets from the drone footage, which they often post through social media. That footage also runs in the store TVs. A big part of developing the resort and tourism in the area is growing new generations of boaters. Given the cost of what a new boat costs, including dockage, insurance, fuel and on and on. “It’s gotten so expensive and cost prohibitive for a lot of first time boaters,” Johnson said. 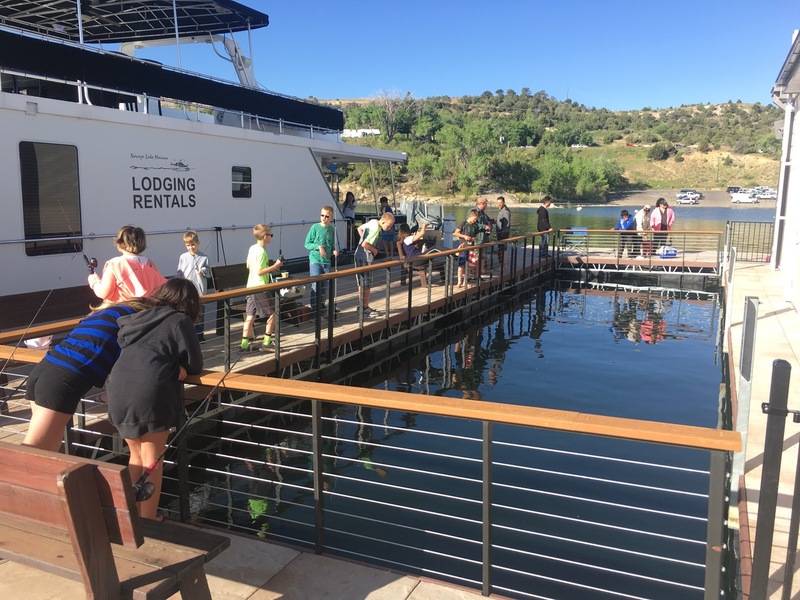 The marina wants to introduce kids to the water at a young age and create cost-effective avenues for generating new boaters. They can start with non-powered water craft, or many other water activities for the kids like the splash pad and fishing hole and new this year to the marina is bumper boats. From there, boaters can move to boat rental and to ownership. To help bridge the gap between boat rental and ownership, Navajo Lake Marina signed with Freedom Boat Club to open up a franchise this year. New boats arrived in March 2018, starting with four boats. In all, the marina has 18 new boats coming this year. “I believe in doing our rental fleet with new boats,” Johnson said. “That gives us the ability to be more like a hotel. If there’s a leaky toilet in hotel room A, they’re going to put you in hotel room B, and you never know the difference. It’s the same thing for pontoon rentals.” The marina also works with local dealers to get deals on boats. The old store structure will be used to facilitate the houseboat rentals. The vessels can sleep 42 guests. “That’s a lot of linens,” Johnson said. The area also serves as backup storage for the rental equipment, such as anchor rope and coffee machines, which facilitates the hotel-type customer service. The old office will be turned into an exercise facility for slipholders. Johnson said the Durano crowd is oudoorsy and athletic. “They will like that,” he said. Finally, the old restaurant will be used as a birthday party room, to accompany birthday packages with the bumper boats and other water activities. In case that wasn’t enough new for Navajo Lake Marina in 2018, Johnson just closed on another smaller marina across the lake in late March.